The Red Bat of Woodside. Red bat. Photo by Gil Lopez. When New York City flies under the Gotham moniker, there’s a good chance Bat Man will show up in scenes of mayhem. But in this living city, residents usually have to work harder to spy bats, seeking them out in quiet corners or on professionally guided tours — sometimes with the help of modern technology. That wasn’t the case for Woodside, Queens’ Gil Lopez, an edible landscape designer and urban farmer. Later in the evening after the great summer hail of August 15th, he emerged from his bedroom to find this red bat had flown into his apartment livingroom. As it happens, Lopez waved his arms to steer the bat into the bathroom. The bat flew rapidly around his arm-waving host without making any contact, despite close quarters. Lopez was surprised by the bat’s “smooth, gliding flight” and that it was tracking him with its eyes. Contrary to popular mythology, bats have vision. Lopez had thoughts of putting the red bat to work clearing mosquitos away from the urban farm he co-founded, but instead helped it out the bathroom window. Lopez’s five-minute encounter extraordinary; unlike the colonies of little brown bats that pack caves and other hollows in NYC, red bats live largely solitary lives among trees. Because there aren’t social, they’ve been spared the “white nose syndrome” afflicting other bats. Red bats at rest. Photo by Lynn Robbins. Lopez lives across Queens Boulevard from the quiet and leafy New Calvary Cemetery, a pretty ideal red bat habitat. A keen observer might spot them in normal conditions hunting for bugs around street lights glowing amid the deciduous trees of the graveyard. Red bat camouflaged in autumn. Photo by Lynn Robbins. Red bat in leaf litter. Photo by Lynn Robbins. Red bats “can migrate long distances to enhance their survival,” Robbins notes. But a mild winter might yield more red bats — they bear up to five young in a litter, as compared to the two typical for bats. “If there is good weather and and plenty of food, their numbers can grow much more rapidly than other species,” Robbins said. Biggest Full Moon of ’09 Tonight! Full moon perigee of 2008 by Ron Hodges. What a Wolf Moon this will be! Tonight will be the biggest full moon of 2009, and the glory it borrows from the sun will be reflected from every snowy rooftop, branch, and field…if the clouds break. The moon increases in apparent size for two reasons. Routinely we observe an apparent swelling in the moonrise. Because of a quirk of human optical neurology we percieve the moon as larger on the horizon, rather than overhead. But the moon is also at times closer or further from Earth in different points of its elliptical orbit. Tonight is perigee, the closest pass. It will appear 14 percent larger and 30 brighter than what you’ll typically find for the rest of the year. Near-full perigee moon. Captured Jan. 9 in Kingston, NY by Jeffrey Anzevino of Scenic Hudson. Of course, oldsters might tell a young’n that the moon was bigger and brighter when they were young. Well, they’re right in fact but there’s no way a human could detect it: the satellite is ever-so-slowly spiralling away from its host planet. Each year it stretches our gravitational bonds by about 1.6 inches (4cm). The moon tantalizes us, draws us into the Cosmos beyond. At some level, this is our narrowness making us silly: we are born, live, and die in space as much as those who might do the same on any other world. Still, it remains a place of national posturing, from the Space Race of the 1960s to the emerging powers of India and China. For an inner city child, however, the lure of the moon is that it reveals a real topography to his or her eyes from any street corner, even without expensive equipment or the crystal clear skies of the backwoods. As South Bronxite Neil deGrasse Tyson told me for a Village Voice article, a realm of personal possibilities was opened when he stared at the moon from his stoop through a pair of binoculars after his father took him to Hayden Planetarium at the American Museum of Natural History. He is now an astrophysicist and the Frederick P. Rose Director of the Hayden Planetarium. * As a side note, the mountains are seen better on a half or crescent moon, because features are seen in relief. Straight on, light bounces back up from every little crevice, washing out our view. If a seal falls ill in the Gowanus Canal, a turtle catches an autumnal chill in Montauk, and a dolphin gets marsh bound in the Great South Bay, there’s a good chance they’ll end up as roommates at the Riverhead Foundation for Marine Research and Preservation. As New York State’s only authorized marine mammal and sea turtle rescue group, the Riverhead Foundation is called upon to perform rescues and verify unusual sightings throughout the southern New York salty shorelines — the Long Island Sound, Atlantic Ocean, New York Bight and New York Harbor. The small, overstretched staff is like an aquatic A-Team housed within the Atlantis Marine World Aquarium, a well-run regional attraction where sting rays poke up to kiss you right upon entering the door. Really. Well, okay, and be fed. Our Nature Calendar group of five was ushered into the back rooms where the Riverhead Foundation does its work of assessing, monitoring, and healing animals held in cylindrical tanks for eventual release into the ocean or transfer to another aquarium. The most frequent guests are seals and turtles (we saw about ten of them, representing a mix of species that including harbor seals and a loggerhead turtle that had arrived an hour before us), though dolphins and porpoises are regulars too. You’ll know that turtles are in residence if upon stepping off the decontamination shoe pad you’re hit with a wave of warm, moist air. Some “cold stunned” turtles appear dead because they’ve been immobilized by temperature drops, before they could migrate to warmer waters. Other turtles can’t dive well because of trapped gas pockets in their shells. This makes it hard to feed, leaves them vulnerable to predators and boat injuries, and above-surface shells sections can degrade with prolonged air exposure (as with the patient below). A bubble can be drained, but evenly distributed gas is a challenge. Sometimes weights are added, or the turtle is found unfit for release. Flipper injuries like the one photographed below were common (suspected shark bites) among turtles, as are propeller lacerations. Even double rear amputees can survive in the wild, explained Robert DiGiovanni Jr., director and senior biologist at the foundation. Whirl pools at the center of seal tanks mimic ocean currents and combat muscle atrophy. Seal pox further weakened a few already struggling pinipeds. The viral disease, which isn’t transmittable to humans, runs its course with the severity and duration of our experience of chicken pox. Instead of many small pustules dotting the skin, however, seals get several larger, hard knobs near their faces and flippers. Perhaps more surprising was how common eye injuries are among seals. Of course, those at the foundation were being rehabilitated and weren’t representative of the general population. It makes sense, however, that seals would often get bitten or poked around the eyes as they rooted around the seabed. The staff takes special care to not bond with the animals, so that they retain natural behaviors and a healthy aversion to humans upon release. As social mammals with expressive faces, seals make this particularly difficult. Well, at least for me. The female seal I photographed below and I had some immediate chemistry. Ms. Wocial mildly reprimanded me for lingering and chatting with this pirate-eyed beauty. Staff and highly-trained volunteers work together in both rescues and releases, with the latter being sometimes nearly ceremonial. Sponsors who “adopt” seals and turtles come out, as do reporters and other friends of the foundation. Sometimes a dolphin must be gently ushered out of its tank by a wall of staff and volunteers wearing dry suits, with arms interlocked. Slight injuries, sometimes quite painful, are common among the humans. Costs for rescue, rehabilitation, and release range from $6500 for a seal to $120,000 for a dolphin. Medical machines are always needed, Mr. DiGiovanni said, and often come through hospital donations. One recent acquisition greatly improving the Riverhead Foundation’s field work is a portable unit to test for blood gases, electrolytes, and glucose levels. Released patients of the rescue hospital have paid back their human tenders with unprecendented revelations. Tracking devices on their backs have mapped migration patterns, not only north-to-south, but inshore and offshore, where deeper waters have steadier temperatures, according to Mr. DiGiovanni. The foundation doesn’t necessarily deliver animals to places near their rescue locations because they usually swim hundreds or thousands of miles within weeks or months of returning to the wild. Our own path was more predictable. As people now contaminated by seal pox, we were slipped out the back door. Our hosts apologized for the necessity, and stopped short of making us wear leper bells. “ADOPT” a rescued animal, make a cash or in-kind DONATION or become a MEMBER. One of Cliff Reiter's virtual snowflakes (Lafayette College). Some of the loveliest snowflakes you might see this winter glow warmly on a computer screen. Lafayette College mathematics professor Cliff Reiter might share the joy of a kid making snowflakes with scissors and paper, but his computer simulations of crystal growth aim at deeper revelation. The sublimity of his creations attest to the beauty he sees in the elegant algorithms underneath. “Isn’t it the juxtaposition of symmetry with complexity that makes snowflakes beautiful? With models, or mathematical arguments, simplicity plays a role similar to symmetry,” Reiter said. A kid waiting to kayak at the Clearwater Festival last Solstice weekend asked me, “If this is the longest day of the year, then why isn’t it the hottest?” It’s a logical question, and I guess a common one. The incomparable Joe Rao addressed it in his New York Times astronomy blurb last week, and USA Today explored the question as well. The graphic above comes from USA Today. In short, if Earth lacked an atmosphere, then surface temperature, apart from heat retained by rocks, would correlate with sun exposure. But our relatively stable atmosphere slowly and steadily receives energy from sunlight over the course of the spring and summer, as days lengthen. That energy, which we feel as heat, builds higher and higher until reaching its peak in July and early August. I suppose an economist might call day length a leading indicator of summer, whereas as temperature is a lagging indicator. Swimmers and boaters (who are perpetually potential swimmers) know that this phenomenon of delay is even more pronounced with water temperatures. Of course both air and water move around, so there’s a good bit of chaos and complexity to the fluid dynamics that make for summer weather and those late night skinny dips in open water that feel as warm as a bathtub. But the principle of heat retention is a far more powerful truth than its exceptions. I’m also reminded of my good friend, David Grinspoon (with whom, for the record, I’ve never skinny-dipped), who joined us with comments about the Orion Nebula for the very first essay on Nature Calendar. He’s an astrobiologist (with an Earthly incarnation as a rhythm guitarist) with prestigious Mars and Venus robotic probe science assignments from both NASA and the European Space Agency, and serves as the curator of astrobiology at the Denver Museum of Science and Nature. He’s devoted much of his career to the planet Venus. He notes that if there was intelligent groundling life on Venus, it won’t see dominant temperature zones as we see them, corresponding to latitude, but instead look skyward to temperate altitudes. This is because Venus has an atmosphere that’s so dense, and therefore conductive, that heat overloads long ago seeped across all geographic areas. The surface is now isothermic, meaning that temperatures at the poles and the equator are the same. It’s gotten so hot there, due to a greenhouse effect gone into overdrive, that David postulates Venusian life would prefer a cloud habitat. Of course, our cities perversely punish themselves, with air conditioners dumping extra heat into the dense local ecosystem through their exhaust, building electrical wires, regional transmission lines, and the power plants required to power them. Makes you wonder if there’s intelligent life on Earth. I live I high up in an apartment on 8th Avenue in Chelsea with a balcony that faces east over the city; perfect for watching thunderstorms. The thunderstorm that has brought a bit of relief from the recent heat, came in strong and moved out fast last night, with the lightning visible to me first in the southwest and then seeming to move eastward around the island, finally disappearing uptown. A hard rain fell just briefly on Manhattan in the middle of the storm, miring the clarity of the lightning and muffling the thunderclaps. 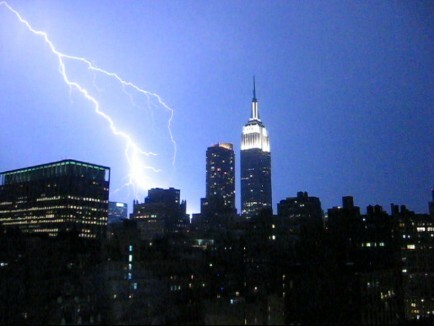 I’ve read that lightning strikes the Empire State Building around 100 times a year. It is a wonder that any structure can withstand being hit repeatedly with bolts that are temperatures hotter than the surface of the sun. That said, it has become clear to me over the years of watching thunderstorms rage around the city, that lightning does not always strike the tallest object in an area, in this case the Empire State Building, or even the top of the tallest object. How I made it so many years believing this myth I don’t know. Furthermore, lightning doesn’t always travel from cloud to ground, but often occurs inside a cloud or arcs from one cloud to another. I love being in the middle of electrical storms. All those shock waves and charges flying around me bring an energy and excitement that is unique and humbling. 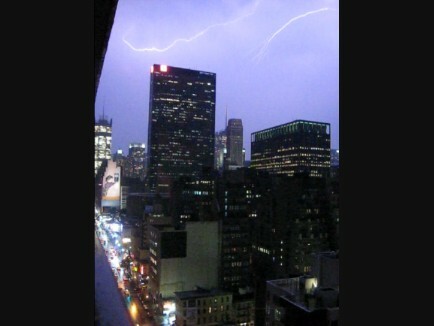 In this big city, the electrical storms are just about all that can dim the bright lights, even if only for a second. A glance at this red-tailed hawk brings to mind its famed cry, which Cornell University notes is dubbed into the beaks of hawks and eagles in movies and television shows ad infinitum. In reality you’re seeing a hawk pant. The iconic Unisphere in Flushing Meadows-Corona Park is home to a pair of hawks whose nest is in the Indian Ocean, so to speak. But that exposure, perhaps worsened by glaringly reflective metal, drove this bird down below the shade of the tree canopy. 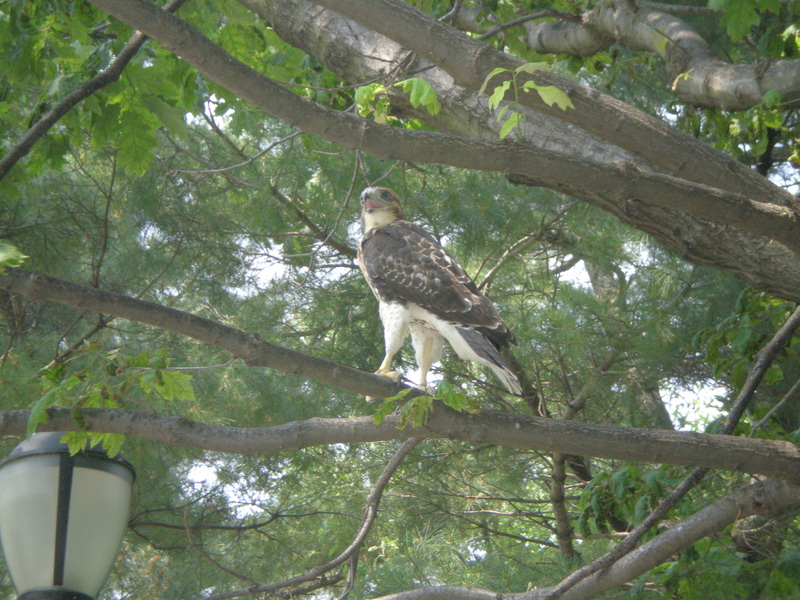 My kayaking and biking buddy, Richard Furlong of LaGuardia Community College’s ESL program, found himself ten feet below this hawk while in the park for the Tour de Queens and took these shots (click to enlarge). 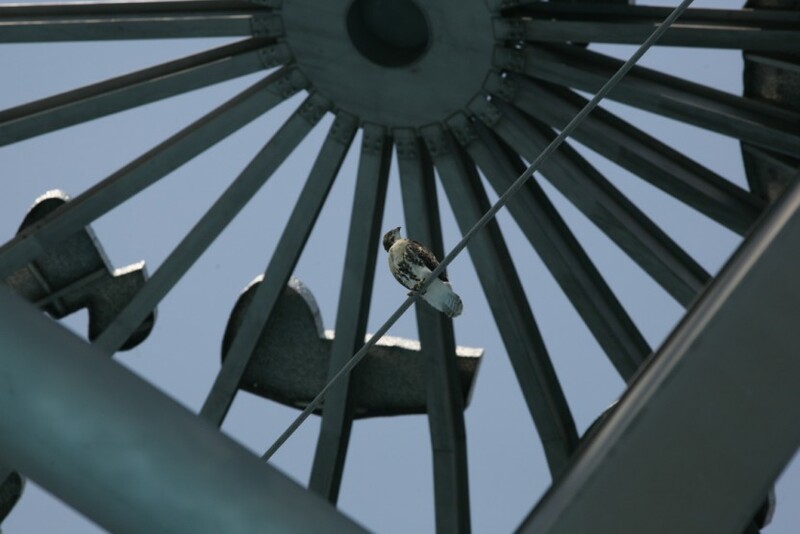 Another friend, Emmanuel Fuentebella, captured the other hawk in these photos as he (I believe, since it looked smaller) watched the crazily busy skateboarding circle at the base of the Unisphere. I was shocked at the idea of a hawk scooting under leaf cover to close to the ground, even though a friendly Queens knitter, Helen, told me of a red-tailed hawk living at a local courthouse that was equally unphased by human company. It’s still commonly believed that red-tailed hawks will soar to cool down, with temperatures dropping with rising altitudes. Skepticism is building, as shade seeking is far more apparent. Also, soaring is an effective territorial and mating display, explaining many hours spent aloft while not hunting. 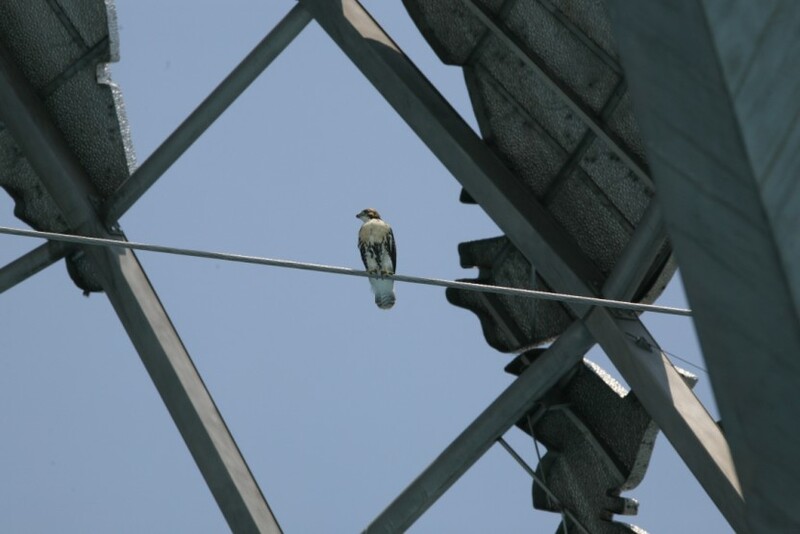 Other bloggers (http://www.fordham.edu/politicalsci/profs/fleisher/NYC_hawks.html, http://adevolution.wordpress.com/2008/04/26/update-animal-profile-red-tailed-hawks-of-flushing-meadows/) have noted that the Unisphere hawks are very attentive to their nests, giving rise to hopes for a new generation. I worry that the heat, which is LOUDLY breaking in a storm as I type, might endanger eggs or hatchlings. Ferruginous hawks, a more heat-adapted North American desert species, suffers markedly higher infant mortality rates as temperatures rise. Though nests seem to be located regardless of shading, adults and hatchlings alike seek shade. Strangely, the first motivation for fledglings to leave the nest appears to be to find shade (not to mothers everywhere – send junior packing by turning off the air conditioner). Another surprising aspect of ferruginous hawks’ is that their remarkably large gapes might be an adaptation to pants more effectively in addition to consuming large prey. 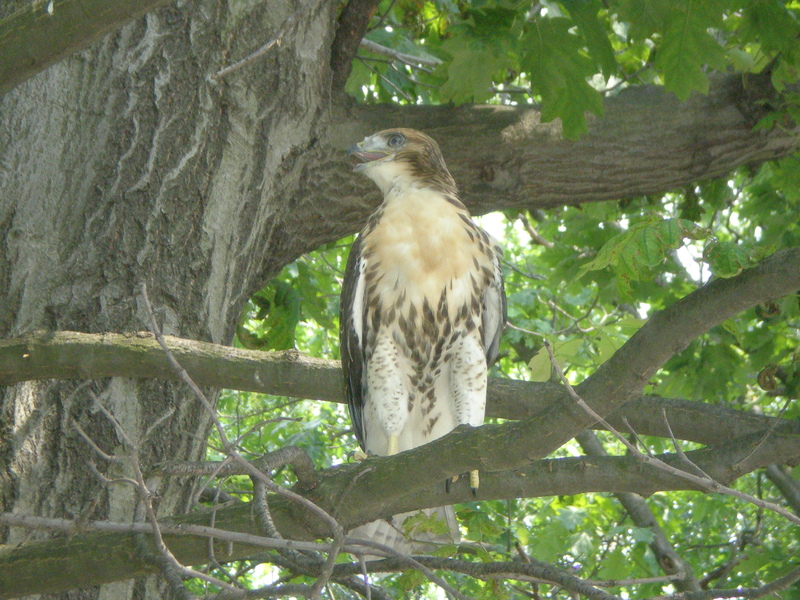 As a small side note, hawks’ young were found to die from heat stress in greater numbers when ill fed. I wonder if there’s a compounding problem here, with potential prey hunkering down, even under ground, to remain cool while riding out heat waves. Let’s hope for the best, and watch and learn.